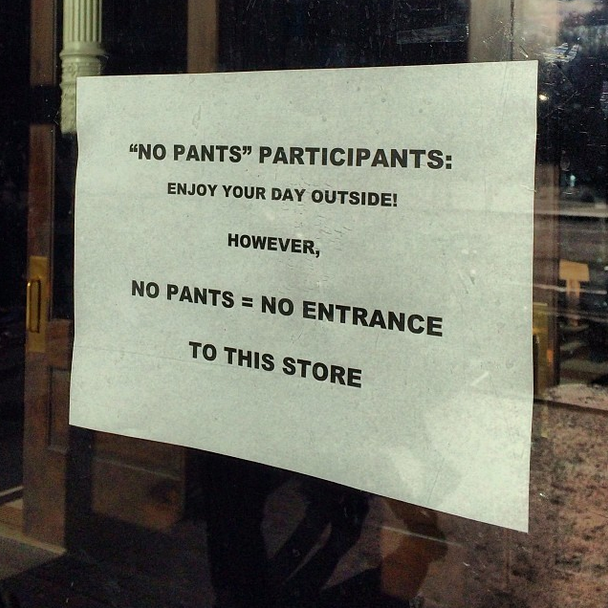 I knew what this was about, but it got me thinking about people who don’t know what the “no pants” day is and what went through their minds reading the signs. Well, I guess no pants, no books. Maybe some bookstore goers need to be reminded about that from time to time… hey, this is New York! If you found it funny, you should check out the Improv Everywhere website for more information on their upcoming events. Go to improveverywhere.com and check out everything they do. Thanks for reading and see you soon! Oh, and make sure you put your pants back on for your subway ride tomorrow, the event is over!